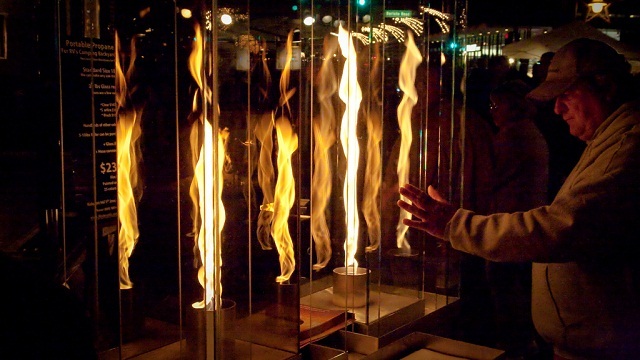 William Gurstelle — Forget fireworks, celebrate this 4th of July with a towering inferno of science. Practical Pyromaniac William Gurstelle explains the physics of the phenomenon and shows us how to build our own. Fire tornadoes, also known as fire whirls, were a key factor in the extreme deadliness and destructiveness of the October 1871 fires. They form only rarely, when a “perfect storm” of wind, low humidity, abundance of fuel, and bad luck come together. But such were the conditions in Chicago and Peshtigo. The Fire Tornado dramatically illustrates the effect air has on a fire’s shape, burning rate, and fuel consumption.